Ruckus is definitely barking over the April 2014 BarkBox! This month's BarkBox couldn't come at a better time. I received it today on my front porch. The March BarkBox is Breakfast-Themed! Quick reminder that the BarkBox Giveaway ends tomorrow (3/20) via Rafflecopter below. Thoughtless Thursday #5: February 2014 BarkBox Review and Giveaway! I was lucky enough to win a 6-month subscription to BarkBox from WrappCorp & BarkBox via Instagram. 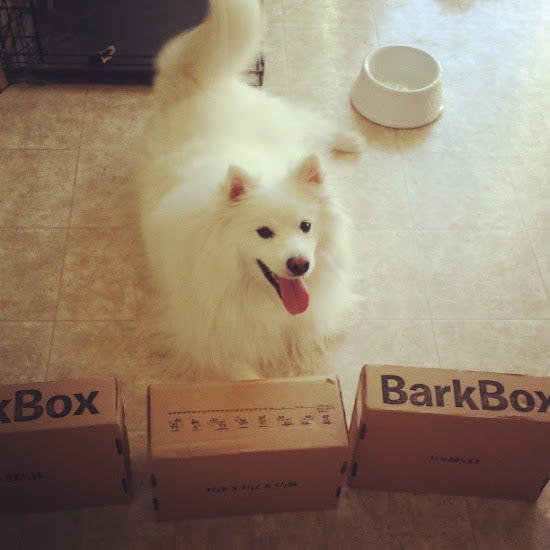 Read about it here--> My first BarkBox! Happy Black & White Sunday! This upcoming holiday, BarkBox & Ruckus the Eskie are teaming up again to share to one lucky pup/dog a 3-month subscription to BarkBox! My sapiens received some organic persimmons and decided to do some research to figure out if persimmons are safe for dogs. They have training in veterinary medicine but I still wanted to share their collection in this process. Citations as noted. Don't I look like George Washington here? Welcome to this Tasty Tuesday! I wanted to share with you my November 2013 BarkBox (Medium /Size). Look away because this is definitely a SPOILER ALERT! Welcome to the ScoopThatPoop Campaign!! This is my second contribution to this campaign! To encourage sapiens to help scoop that poop, I thought it would be fun to do a little giveaway by PoopBuddy. Sometimes a dash of color and a splash of convenience will do the trick! Enter for your chance to win a one month subscription to PoopBuddy! Woof! Wag! Play! That's exactly what I'll be doing with this October Box! Not too long ago, I was contacted by BarkBox to partner up for a fun campaign. Of course, my tail started wagging so hard, it knocked off everything around me. Just wanted to share that I won the #summerofpetbox contest on Instagram from PetBox! It arrived last week, late due to shipping difficulties but finally made it! If that contest is still going, I suggest you pups get on it! What happens when you drop a poop? Well, that poop needs a buddy to help move it along, hence Poop Buddy to the rescue! This Thursday I am thankful for the early arrival of my second BarkBox! I won my first contest over the summer to a 6-month subscription to BarkBox. Thank you Wrapp Corp & BarkBox!